First, a confession – I am a lifelong science fiction fan… and, an even more telling confession; I remember the excitement when the first episode of Star Trek aired on TV. Consequently, I was delighted when a Christmas present from my son and DIL was a visit to town to see 3D Avatar. Beyond the incredibly beautiful visual experience, which was like moving through a painting, the most interesting aspect of Avatar was the fact that Sam Worthington’s character, the marine, Jake Sully, actually did “walk a mile in another’s shoes/moccasins.” And “walking that mile” did literally change his perspective. What does Avatar have to do with understanding content and literacy in the 21st century? I hoped that Social Media would give an opportunity for people to literally “see the world through each other’s eyes,” without being subjected to Mass Media filters and gatekeepers. Understanding the limitations and problems of different groups, within our own country and in other parts of our world, would create greater openness and greater empathy, leading to positive solutions to intractable world problems. What has Social Media accomplished so far? It has allowed people who share similar ideas to more effectively find each other and reinforce commonly shared views. In addition to common global issues, most areas of the world have regional controversial issues. In the case of Newfoundland and Labrador, the most publicized controversial issue is the annual seal hunt. Each spring in the past, the hunt has given rise to competing mass media campaigns. This year, I had anticipated there would be competing Social Media campaigns. Looking at FaceBook this morning, I noticed the opposing camps have already started. In the future, we will to see more advertising, promotion, and political campaigns move to Social Media. To quote Mashable.com, “For the first time in 23 years, Pepsi will not have any ads in the Super Bowl. Instead, the company will be spending $20 million on a social media campaign it’s calling The Pepsi Refresh Project.” We have all heard of the effect of Social Media on the election of US President Barack Obama. What will be the future impact of Social Media on communication of ideas? Much of the literature about Social Media discusses how to use Social Media to market or to propagate a specific point-view. For example, the “experts” suggest how to become “personable” in Social Media, since being “sociable” multiplies “trust” in the message you are delivering. They want the reader to perceive the message as coming from a trusted friend…which can be very useful…but it can also be truly scary. Allowing people who hold the same views to find each other through networks of friends and followers. By mining information about selected groups, marketers can target their messages to a very specific demographic with known opinions on a number of matters. Permitting people to express views with relative anonymity. This enables marketers to send carefully worded planted comments to groups in order to influence opinion. Letting people use “loaded” words, sweeping generalizations, and other types of expressions without being challenged. Marketers can utilize this in two ways: they can plant message to goad people into more extreme views or they can maliciously add questionable material to legitimate groups, discrediting the group with other sources and with some of its own members. Having no rules about who can join a group. Marketers can establish paid or unpaid “monitors” to penetrate groups to examine comments, enabling them to determine what type of advertising will be most effective for that particular demographic. Accepting multi-media materials from unknown sources. Marketers can quote “data,” display photosphopped or staged images, and post edited videotape, for which they do not give legitimate sources. Even without outside intervention from advertisers, marketers and branders, how Social Media impacts issues leads to a number of important questions. Why do individuals form groups and acquire followers in Social Media? Do they want to examine issues, stimulate informed discussion, or acquire knowledge…or do they form groups to reinforce and to exaggerate opinions already held, leading each group to espouse more extreme positions? What, if any, is the impact of these groups on people who are not committed to one side or the other? So far, what I have observed is people comfortably slipping into their old shoes and old thoughts, sometimes propelled by varying amounts of deliberate manipulation and misinformation. If Social Media is to have any impact on solving world issues, we need paths to each other’s situations. Like Jake Sully, we need to develop empathy by “walking a mile in another’s shoes/moccasins.” We need to be able to clearly recognize and distinguish fact from marketing, branding, and propaganda. The first step to achieving that goal is greater awareness of many of the tactics of propaganda which are being used by all sides. Over the next few weeks, I intend to discuss these in more detail. Another of our clients is the town of the Carbonear in Conception Bay North, Newfoundland and Labrador, which has been our client since 2004. Over the past year, the town website has had 52,485 visitors, viewing a total of 220,323 pages. In addition to the town website, we have developed and maintain a website for the Princess Sheila NaGeira Theatre which is a 384 seat, air conditioned and wheelchair accessible facility, set in the heart of the Baccalieu Trail Region. 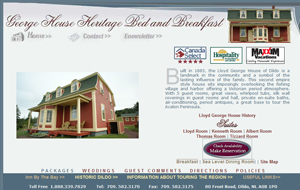 We also have design and maintain a website for the Carbonear Heritage Society. We have designed a booklet about the town of Carbonear in 2008.